A Course of Action is a powerful foursome that brings many years of musicianship and a genuine love of music for the sake of music. 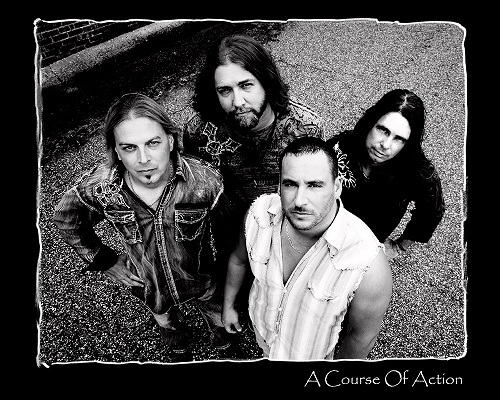 They are known for incredibly tight live shows, commercial edgy, radio-friendly, hard-rock music that promises to break the cycle of “new” rock styles and refocuses listeners on solid rock music, with clear influences of Alice in Chains, Tool, Sevendust and current influences such as Alter Bridge. Lead guitarist, Jonathan Byrd, played on the national scene in a Mercury Records act known as Copperhead in the early 1990’s, but when that band met their demise, he and former Copperhead bassist, Tony Hawkins formed Hybrid in 2000. They recruited for 3 years to find the right singer to solidify their vision for Hybrid, and they found that reality in John Culberson, a South Carolina native who also had regional success in True To One. Hybrid had a lot of regional success from 2003 until 2008, but with the advent of social marketing, the name Hybrid became too broad to brand. The band was at a crossroads, and with an imminent name change, also came a lineup change, when the band parted company with drummer, Okey Parsons. The band soon added Florida native, JT Silvestri on drums and most recently, the band said goodbye to founding member, Tony Hawkins, but gained Wes Johnson on bass guitar. The band has been making huge strides month after month since then. 2012 has been a fantastic year, and bodes well for the events to come in 2013. A Course of Action will be a band to watch. The band is known for tight live shows, great music and solid original material. Hailing from North Carolina, South Carolina and Florida, the group brings many years of musicianship and a genuine love of music for the sake of music. That coupled with a strong DIY work ethic, the band seems poised for great things. Once the band was asked, “what is your gimmick?” The answer was, “there is no gimmick. We are just four normal guys from the South making great rock music.” The band is currently supporting their debut, full length album, titled “Dark Before The Dawn”.